A weekly inside look at the unique faces and personalities that make up The College of Wooster community. 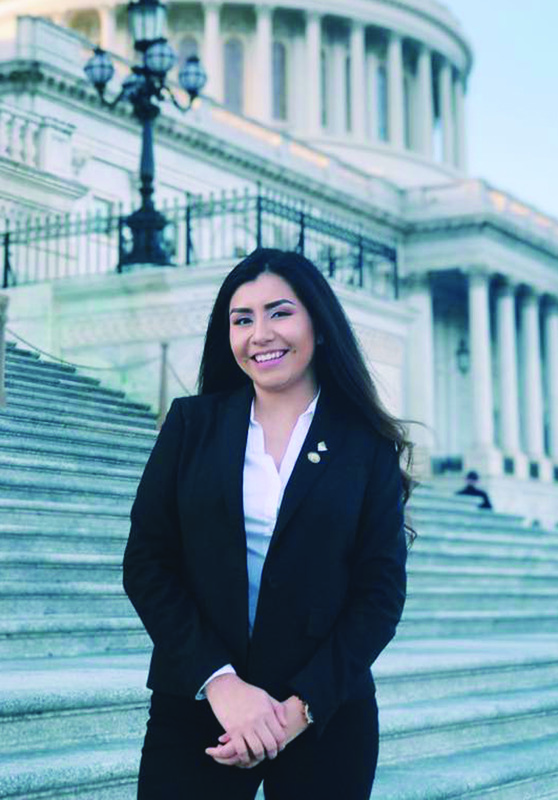 Margie Sosa, a sophomore political science major, balances her time spent as founder of the First-Generation Student Organization, member of Proyecto Latino, Senator At-Large for Student Government Association and coordinating events of social activism on Wooster’s campus. How has your upbringing molded or challenged you to become the person you are today? I take pride in an upbringing that, although filled with adversity and hardship, is emblematic of the American dream. I was born in Arequipa, Peru and immigrated with my parents to the United States at the age of five. From a young age, I witnessed my parents struggle to learn English, to find work and to secure stable housing in order to give me the opportunities they could only dream of. Both of my parents always emphasized the importance of education growing up and have instilled in me the drive and ambition to be successful. I would not be here today without the sacrifices they have made and continue to make to give me a better life and future. What drives you to bring students together on campus that have a shared identity? Because Wooster has definitely been increasing the diversity of its student body over the years, it’s imperative for students who have a shared identity to find a community where they feel like they truly belong and can invest in. Personally, my experience as a person of color at a predominantly white institution has been very lonely at times, but I found comfort in people who understood my lived experiences. Therefore, what drives me to bring students together on campus is my personal experience at this institution and the ability to create those communities where students that are often underrepresented can share a space and foster relationships. Can you explain what inspired you to form First-Generation Students Organization (FGSO)? What impact do you want FGSO to have on campus? Witnessing the effects of power and privilege in educational spaces, my experience at The College of Wooster exposed me to many inspiring stories of those in marginalized groups making their way through higher education. FGSO was inspired by the struggles that many of my friends and I faced transitioning into college and through the inspiration and support of other first-gen organizations at different institutions. I hope FGSO helps increase the institutional support for these students on campus and makes it easier for future first-gens to navigate Wooster and feel supported. What was your experience with the Galpin Call-in like, and how has it affected your opinions of activism? My experience with the Galpin Call-in and being one of the organizers has definitely shown me the importance of student activism, especially within college campuses. I feel like the experience I have of getting together with student leaders from all different organizations on campus and collaborating on what we think we need to change on campus is very crucial. What advice do you give to people who are hesitant to participate in activism if they don’t think they have the power to make change? I feel like you make time for things that you are passionate about [and] that you think are important, so although you are only one person and can only do so much, if you never try or if you never participate, like for instance the Galpin Call-in, you never will truly know whether you can make a change. What change do you want to take place further at the College from here on out? I definitely want to unite the Latino community here on campus. I feel like ever since I came to campus, the community wasn’t as active like the Black Students Association or other organizations on campus, so I want the community to have a more active role by having more events with organizations and increase student activism within the Latino community. Our Latino leadership isn’t as prevalent as black student leadership on campus, so I would say that I would definitely love to see that change. I got accepted to Oxford University! I will be a Visiting Student studying Politics and Modern Language while living in Lady Margaret Hall next year.